Pakistan calls for more focus on improving women's health to address maternal malnutrition. 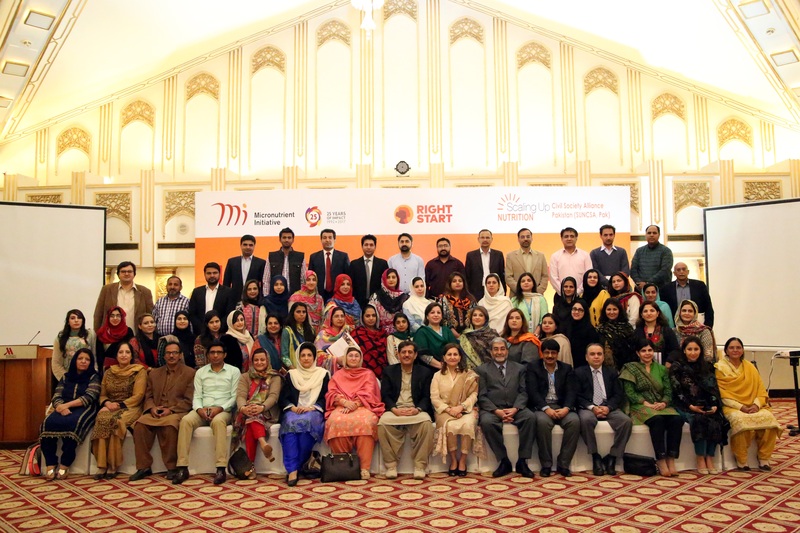 On 6 March 2017, in connection with International Women’s Day, the Scaling Up Nutrition Civil Society Alliance Pakistan (SUNCSA,Pak) with the support of Micronutrient Initiative (MI), held a seminar on the importance of maternal malnutrition in Islamabad. Delivering the inaugural remarks, Ayesha Gulali, member of the National Assembly, applauded SUNCSA,Pak and MI for highlighting the crucial issue faced by most of the Pakistani population. Ms Gulali made a commitment to raise the issue of maternal malnutrition on the floor of Pakistan’s National Assembly and will advocate to the Khyber Pakhtunkhwa government for the enactment of necessary legislations and allocation of adequate resources to address malnutrition. Aslam Shaheen, Chief of Nutrition at the Planning Commission, member of the SUN Movement Executive Committee and the SUN Government Focal Point, recognised the importance of the seminar in highlighting the issue of maternal malnutrition and in showcasing the achievements of women leaders from all walks of life. He said that the government of Pakistan, along with partners, is striving hard to scale up nutrition programs at both provincial and national levels. Mr. Shaheen shared that all provinces had developed multi-sectoral nutrition strategies whilst a fededral level multi-sectoral nutrition strategy is being developed by the Ministry of Planning, Development and Reform. Dr. Shershah Syed, Gynecologist and President of Pakistan National Forum on Women’s Health. Concluding the ceremony, Dr Abdul Baseer Achakzai, Director of the Nutrition at the Ministry of National Health Services, Regulation and Coordination, said that the direct outcome of high rates of malnutrition in women is seen in the form of long lasting adverse effects reflected by high maternal mortality and morbidity and its perpetuating effects on infant and child growth and development. He stressed that Pakistan is facing a malnutrition crisis that is amongst the worst in the world which has not improved for decades and called for urgent action in order to safeguard the country’s future development and prosperity.